Ferns or palm trees? Anyway, this mosaic art will refresh your decor and entertain you as you walk, swim, or do your morning shrubs. PROs: Handmade tile mosaic art composed of high-end natural marble tiles that is guaranteed to transform your space. Mosaicist: Haith D.
CONs: You may find yourself looking on the floor too much. 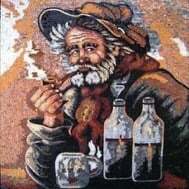 This stunning mosaic art is perfect as a mural or floor inlay for any office, home or retail space. Our mosaics are made from natural marble and stones, naturally resistant to different environments (dry, moist or wet) and weather conditions (frost, sunlight or extreme heat).